shortly after the 21-Tone Just Intonation guitar was completed. 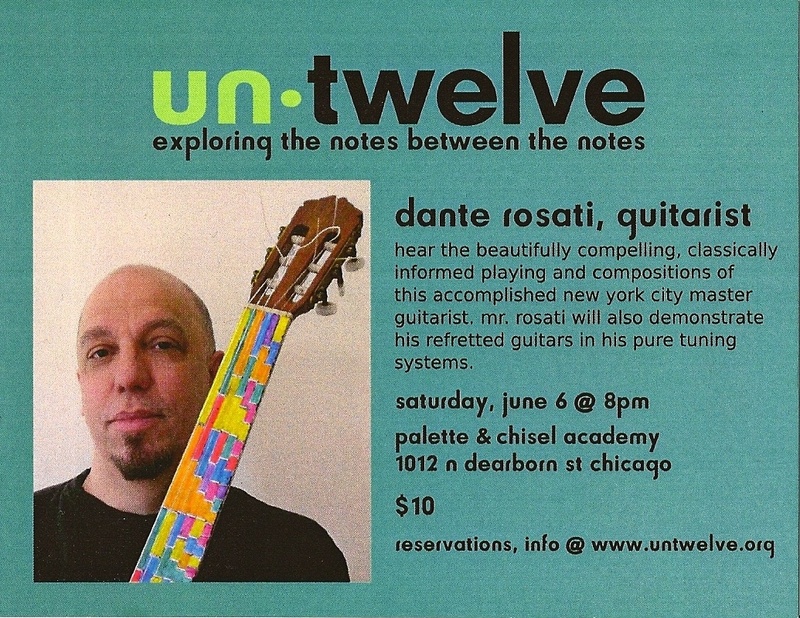 Chicago, 2009 concert at the Palette & Chisel Academy, sponsored by Untwelve. The first guitar I refretted was the 21-tone Just Intonation guitar. 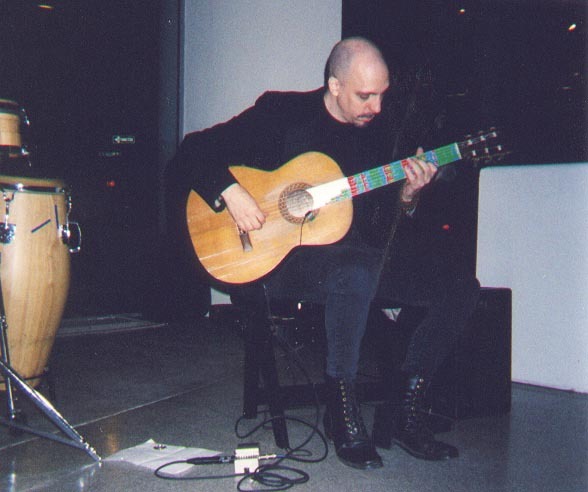 To read about how I adapted an old Ioannou guitar, why, and how the tuning was derived, go HERE. The colors have to do with the prime limit of the interval: red for 2 and 3 limit, green for 5 limit and blue for 7 limit. There is more about this in the article linked to above. Peira This is the first piece I wrote to explore this tuning. It is an ancient Greek word meaning "trying-out". Statue of Alice This is a recorded improvisation, done after a visit to the statue of Alice in Wonderland in Central Park. She's sitting on a giant mushroom. Need I say more? Arbor Low Arbor Low is the name of a prehistoric henge I visited in Derbyshire, England. While thinking about various ways of deriving scales from the harmonic series, I wondered "Why derive a scale, why not just use the harmonic series itself?" This guitar is the result of that thought. 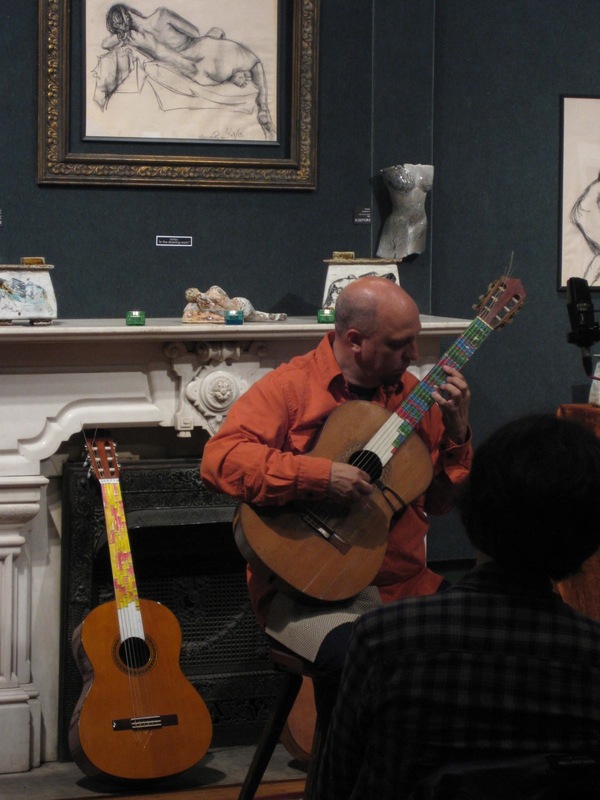 Due to the limited range of the guitar, it was not practical to begin with the lowest string tuned to the first partial: doing so would result in the lower half of the instrument's range consisting of just a few notes. By tuning the lowest string to the 4th partial, then the other strings can be tuned to partials 6,8,12,16, and 24, the same open-fifths tuning used on the 21-tone Just Intonation Guitar, and this gives a good spread and playable partials from 4 up to 48. The first guitar I refretted, (the 21-Tone Just Intonation Guitar), used a 21 note scale derived from the harmonic series, using pitches up to the 7 prime limit, and with the scale repeating throughout the range of the instrument. 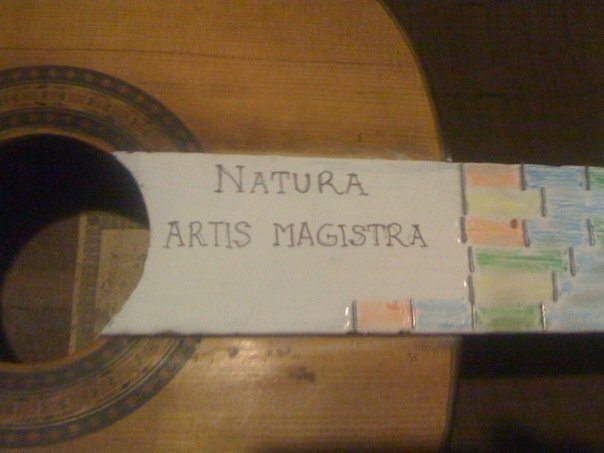 After that, I wanted a guitar that would enable me to play in the harmonic series without limit-ations, so I next refretted an instrument into the Harmonic Series Guitar. 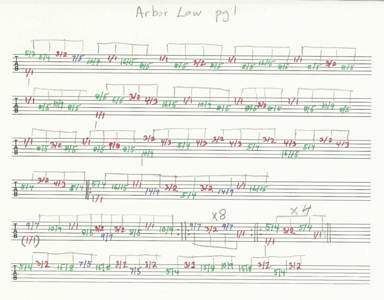 Being able to play partials like 11, 13, 17 and other higher primes was quite interesting, and I found myself wondering if an instrument could be designed that would play only higher prime partials. The Prime Guitar is designed to play prime partials 17-199. The lowest string is tuned to the 17th partial of a series, and the successive strings are then tuned to partials 23, 37, 47, 67, and 89 to preserve the basic tonal spread of a standard set of guitar strings. Since every single note is a unique prime limit pitch, it was not practical to color code the frets in the same way as the previous guitars. On the other hand, it is very difficult to orient one's self on a neck with such irregular fret spacing without any color coding, so I settled on a simple alternating three color scheme that allows for easy visual spotting of where the frets are located. The next idea was to explore a limited part of the basic harmonic series in more detail. I chose to first look at the 4th octave, or 8-15. This gives an 8-note scale that I wanted repeated in each octave of the guitar so I could see what dyads and chords were possible with just this small scale. I say "small" because 8 notes is only one more than the diatonic collection that is used in traditional western music, and is therefore not unlike the white keys on the piano in terms of number of notes and scale degrees. For this reason I thought a good name for this octave would be the "Diatonic Harmonic" scale. Similarly, the next octave (16-31) has sixteen notes, similar to (in some ways, and also so different from, in others) our familiar chromatic scale, so it could be called the "Chromatic Harmonic" scale. The octaves above these, with a never ending, increasing plethora of notes, await other names. This scale has some notes that are very familiar: besides the tonic (1/1), there is a major second (9/8), a major third (5/4), a perfect 5th (3/2), and the harmonic minor 7th (7/4) which, while quite different in tuning from the equal tempered minor 7th, is still recognizable as a minor seventh. There is also the quite normal sounding major 7th (15/8). Of course, all these notes are tuned in just intonation, so they differ from their familiar tempered versions by very little (the major second and perfect fifth) or somewhat more (the major third and minor seventh). Then there are two rather unfamiliar notes: 11 and 13. These are two primes and therefore introduce new families of notes which will reproduce higher in the harmonic series. Here, however, they make their first appearance. 11 (or 11/8) is an almost exact quarter-tone between what we call a perfect fourth and a tritone in equal temperament. As such, it sounds a bit like both, and a bit like neither. It is the first truely alien sounding interval we find in the harmonic series, since 7, while technically outside our musical system as it historically developed, does not jar the ear to the same extent that 11 and 13 do. 13 is a kind of "neutral sixth" although it is somewhat closer to the equal tempered minor sixth, it still sounds very bizarre, especially in combination with the more familiar notes. To me this combination of 6 relatively familiar notes with two alien ones is what makes this octave of the harmonic series quite interesting sounding. Another thing to consider is the richness of intervallic variety between the notes of this scale. 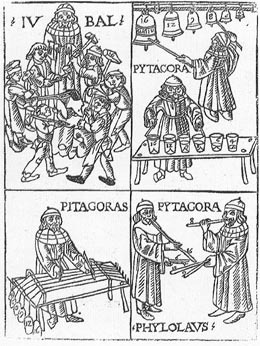 While there are only 8 notes, these produce no less that 48 unique intervals in their various combinations. Recall that the 12 notes of our equal temperament system can only produce 11 unique intervals (assuming octave equivilence of course). It is this great variety, I believe, that makes it possible to get quite a lot of interesting music out of just these 8 notes. One can only be staggered at the thought of the variety of sounds and colors that are available in the next octave with its 16 notes, and higher still. The possibilites for musical expression await any musician willing to open their ears, listen, and then create. There is much work to be done, and we are just at the tip of the iceburg. 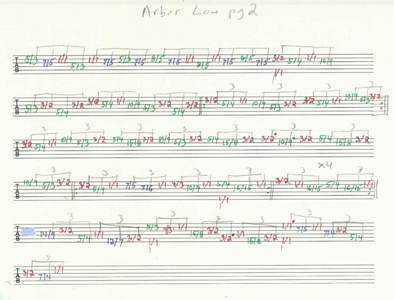 Rather than feeling the creative exhaustion of post-20th century 12 tone equal temperament, we can look to an unlimited future of new sounds that should keep us busy for many generations to come.